Trail running. It’s the leg burning, heart pumping activity that can be so exhausting yet so exhilarating at the same time. 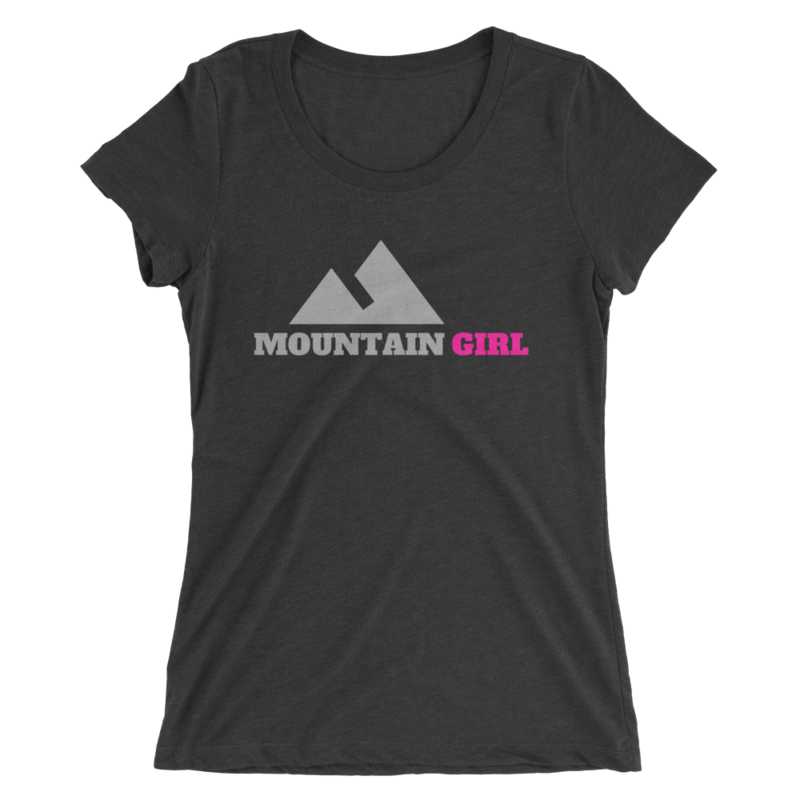 If you are just getting into the sport, imagining running up those steep, rocky trails that must be only meant for hikers seems like an intimidating endeavor. Knowing where to go is key so that you can train your lungs and legs for those high grade climbs and technical descents. After mastering our second round of trails appropriate for beginners you will be ready to to conquer any adventure this summer! This beautiful park is south of Denver and just east of Castle Rock. 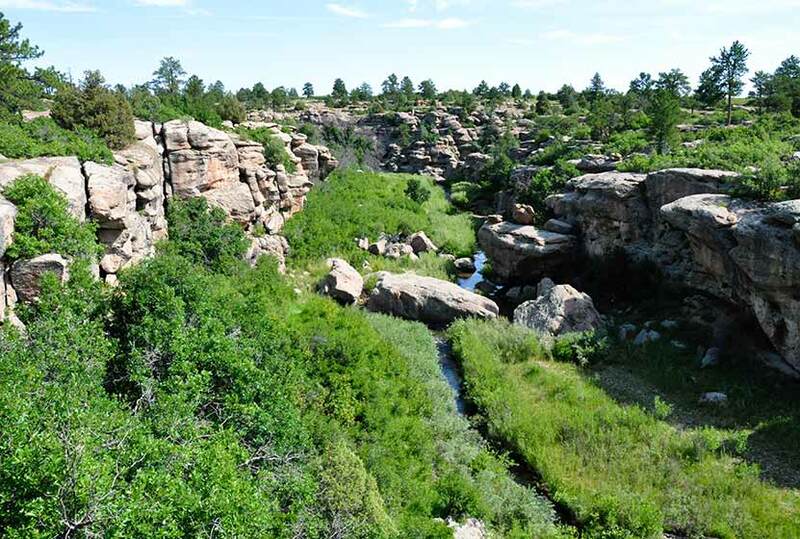 It is a Colorado state park that is well worth the drive and extra fee. We recommend parking at the visitors center and taking a quick look inside before hopping onto one of the numerous trails in the park. You will be surprised when leaving the lot to encounter a wide, deep canyon that seems out of place in the prairie landscape. You can take one of the steep trails down into the canyon and run along the creek at the bottom for miles. Lush vegetation surrounds you but don’t become distracted by the scenery as there are numerous sections creek crossings and boulders to navigate around along the trail. This park is a great place to explore on a hot summer day as you enjoy the shade of the canyon walls, trees and cool breeze. Trail running can be found in more urban settings, you just need to know where to look! For those city dwellers who can’t make it to the trails regularly, the Cherry Creek trail offers some great single track in the heart of Denver. Start around Exposition or Holly on Cherry Creek Dr, find your way to the cherry creek bike path and look off into the brush for the single track trail that darts into the woods and along the creek. This will be an out and back run with up to 16 miles round trip where you will even encounter some surprisingly technical sections of trail! Whether you run, bike, hike or fish (or all of the above), Waterton Canyon should be on your summer to do list. The wide, gravel road winds through the Canyon along the rushing Platte River. *(No true single track trail here unless you up for the 7ish mile one way trip to access the Colorado trail). The road is closed to the public so you can enjoy the quite and sounds of nature. 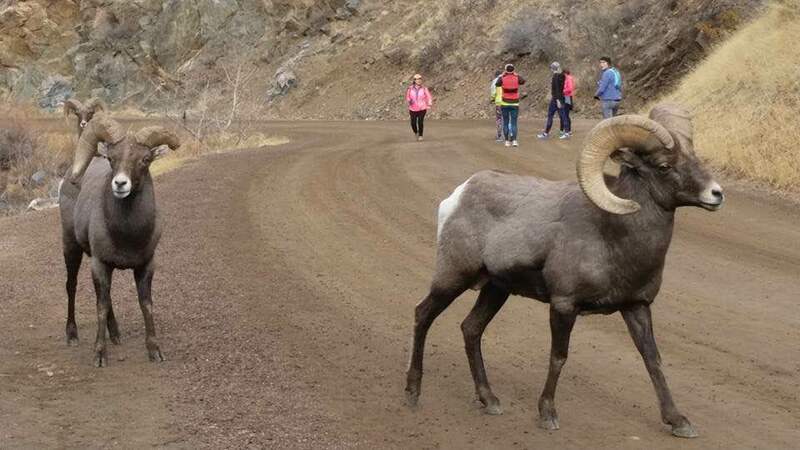 Herds of big horn sheep can frequently be spotted on the rocky ridges and even walking along the road. There is a slight grade on the way out so this park makes for the perfect place for an out and back long run where you can work on your turnover and a quicker pace on the way back. There is little coverage here so make sure to plan for a hot, sunny run. 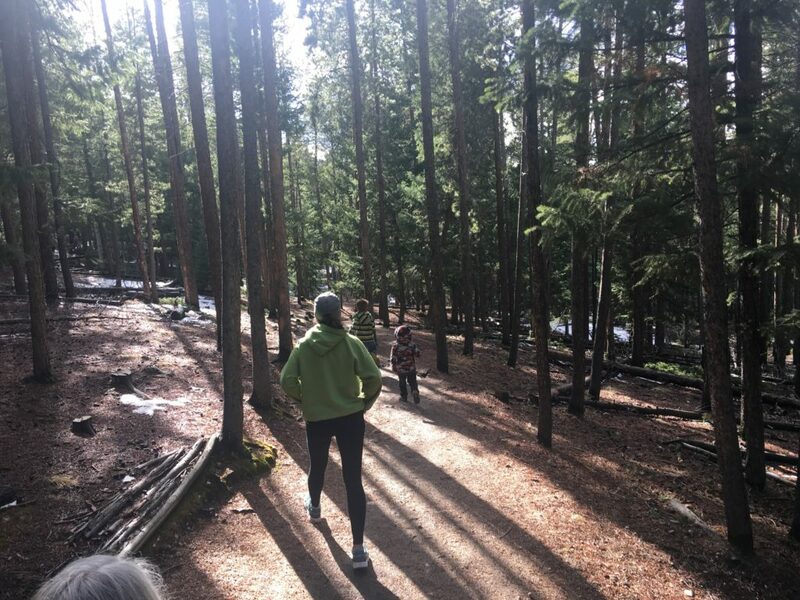 If you don’t mind heading into the hills, Conifer boosts a number of beautiful trails that are appropriate for new trail runners. Myers Ranch is one of those parks. The trails are mostly smooth and wind through forests of enormous old pine trees and groves of aspen. Take the lower loop for a short 2 mile run or the switch backs to the top for a tougher 5 miler. The air is a little thinner up there so plan for more hike breaks to take in the scenery. This park is the perfect place to escape the mid summer heat as most of the trail is completed shaded and for active parents the lower loop is stroller friendly (if you are up for a little adventure and your kids a slightly bumpy ride). 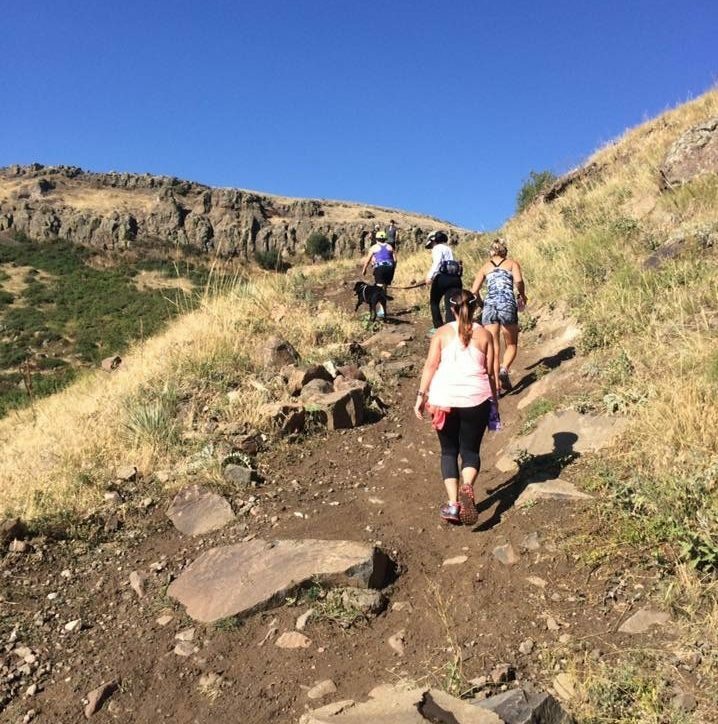 The terrain at North table mountain is perfect for those just exploring the trails and seeking epic views of the city and mountains. For a good “beginner loop”, park in the West trailhead lot off highway 93 then take the North Table Loop west (single track trail) that winds along the base of the “mountain”. Next, take the Mesa Top trail, with switchbacks to the top of the plateau. Turn onto the Tilting Mesa trail and enjoy wide trail with rolling hills and landscape that can be likened to what we imagine running on the surface of the moon would be with multicolored lichen spotting the strange and jagged rocks formations. Complete the loop by heading down North Table loop, a wide, steep dirt hill for a fast finish into the parking lot. Check out our women’s beginner trail running course starting soon with Life’s 2 Short Fitness. This 5 week course entails sessions that meet at different trails across the front range to work on skills and fitness (like how to conquer technical terrain and steep hills) and clinics with expert guest speakers like park rangers to talk about what to do if you see a rattlesnake or mountain lion (gulp) on the trail. Learn more here and sign up soon, spots are limited!